Travel to Micronesia with tour leader Geoff Rodda to dive the historic WW2 wrecks of Truk Lagoon in October 2018. Truk (or Chuuk) Lagoon is the wreck diver's ultimate destination, suitable for both novice and experienced divers. The calm, clear, sheltered lagoon is one of the largest in the world and being relatively free of currents, providing safe, easy diving conditions. Departing 20th October 2018 (ex Brisbane) and arriving back on 28th October 2018 (ex Brisbane), this fantastic dive vacation includes return airfare from Brisbane, 7 nights accommodation at The Blue Lagoon Resort, Micronesia and 12 dives with Blue Lagoon Dive. Package subject to change at any time without notice due to supplier rate changes and USD exchange rates. Package based on $1.00 AUD - $0.74 USD. See the other terms and conditions here. To secure your place on this dive trip, please complete the Dive Adventures Online Booking Form and pay a non-refundable deposit of $500 per person. ALL divers who dive with us at Chuk Lagoon in Micronesia should have DAN dive injury Master or Preferred plan insurance. Please note: DAN dive insurance is conditional on you having appropriate certification for the dive, and that you are using appropriate breathing gas mixes and equipment during the dive or repetitive dive series. Explore massive remarkably intact hulks providing the finest collection of wreck sites in the world. Their cargoes of tanks, trucks, airplanes, mines, bombs, machine gun bullets and thousands of artifacts including beautiful china are there still to be explored. A combination of warm tropical water and prolific marine life has resulted in the wrecks festooning with a variety of soft corals, hard corals and sponges that provide an eerie home for many fish, plankton, and other underwater creatures. Nowhere in the world are there so many wrecks in close proximity, situated in shallow, clear water. Many of the wrecks are visible while snorkeling and there are many on-shore wartime locations to visit. Fujikawa Maru: Depth 0 to 37 metres (120 feet). A 133 metre (437 foot) freighter sitting upright. It is the most well-known wreck in the lagoon. A favourite for artifacts and marine life. The cargo includes Zero aircraft bodies and wing sections, machine guns, bullets, and artillery shells. See also Wikipedia: Fujikawa Maru. Shinkoku Maru: Depth 6 to 40 metres (20 to 130 feet). A 153 metre (500-foot) tanker sitting upright. Some of the best marine life in the lagoon. More than 100 anemones and clownfish, lionfish, soft corals, schools of jacks and a few sharks. Yamagiri Maru: Depth 15 to 34 metres (50 to 110 feet). A 134 metre (439 foot) freighter lying on its port side. Contains the largest artillery shells ever produced and were meant for the Japanese super battleships Yamato and Musahi. Abundant soft corals and anemones. Kansho Maru: Depth 15 to 40 metres (25 to 130 feet). A 115 metre (375 foot) freighter sitting upright. Easy access to the engine room, radio room and galley. Clownfish town at 11 metres (35 feet). Heian Maru: Depth 11 to 35 metres (35 to 115 feet). A 155 metre (510 foot) submarine tender lying on its port side. It is the largest ship in the lagoon. See also Wikipedia: Heian Maru (1930). Nippo Maru: Depth 15 to 46 metres (50 to 150 feet). A 108 metre (353 foot) freighter sitting upright. There is little coral due to depth. Artifacts include artillery guns, a tank, land mines and 2 trucks. This ship has the best preserved wheel house in the lagoon. Fumizuki Destroyer: Depth 21 to 37 metres (70 to 120 feet). A 98 metre (320 foot) destroyer that sits upright. Good marine growth, soft corals, black coral and anemones. See also Wikipedia: Japanese destroyer Fumizuki (1925). The correct name for Truk is actually Chuuk but it is best known worldwide as Truk Lagoon. 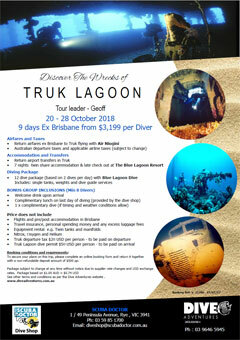 Truk Lagoon is a wreck diver's ultimate destination and suitable for novice and experienced divers. The calm, clear, sheltered lagoon is one of the largest in the world and is relatively free from currents, providing safe, easy diving conditions. On the 7th and 18th February 1944, the U.S Navy launched a devastating air attack on the Japanese Imperial Fleet that was situated inside the sheltered waters of Truk Lagoon. The assault was fifteen times more powerful than the Japanese attack on Pearl Harbour. Code named Operation Hailstone, the initial strike was made up of 72 fighters launched from five carriers. When the smoke cleared 15 Japanese naval ships, 6 tankers, 17 cargo ships, 25 American planes and 250 Japanese planes, were lying on the bottom of the Lagoon. Subsequent air raids in April, May and June sunk more ships and by the wars end more than 60 destroyed vessels were on the Lagoon bed, culminating in the largest naval loss in history. The majority of wrecks lie off Dublon, Eten, Fefan and Uman Islands. The Blue Lagoon Resort is set amongst 14 acres of lush tropical gardens shaded by palm trees, along a white sandy beach on Weno Island. The recently renovated, sprawling resort has 56 spacious air conditioned rooms built in 2 storey, low impact blocks. Each room has a private bathroom, IDD telephone, TV, fax and email service and balcony or verandah to enjoy the views of the outer islands and the magnificent sunrises and sunsets over Truk Lagoon. The resort has a restaurant offering, local and Asian Cuisine, inside and outside bars, a conference room and gift shop. Sea kayak rentals are available and the hotel can arrange visits to the distant atolls for snorkeling and fishing trips. For family members or friends who are non-divers, the World War II history filled island has a taxi service and private tour buses that offer visits to historic and cultural sites. Located on the grounds of the Blue Lagoon Resort is the local dive operator, Blue Lagoon Dive Shop. The dive shop is air-conditioned and provides sales, service and classes. Activities: As scuba diving is the main activity in Truk, Blue Lagoon Dive Centre offers a fleet of fast dive boats . Knowledgeable dive guides provide easy access to the wrecks and allows divers the freedom to dive in small, personal groups. Truk Lagoon is where you will find some if the best diving in Micronesia. When you experience the mystery and excitement of the Fujikawa Maru with its beautiful soft coral growth and schools of colorful fish or descend into the cargo holds of the Sankisan and San Francisco Maru you will understand why the license plates in Chuuk call it "Divers Haven". With over 40 wrecks to dive you will want to extend your trip. Climate: Virtually all of Micronesia enjoys a tropical climate due to its proximity to the equator. The seasons are the reverse of the Southern Hemisphere and it is slightly cooler between December and March. The rainy season in southern districts is from mid-May to late November, with the greatest falls between July and October. The rain is rarely heavy however and there is still much sunshine. Temperatures average around 28 degrees Celsius and humidity averages 80%. Currency: The US Dollar is the preferred currency throughout Micronesia - there is no local currency. It is strongly recommended that you do NOT carry Australian Dollar Travelers cheques as you may experience difficulty in cashing them. Most international credit cards are accepted by hotels, shops and restaurants throughout Micronesia such as Visa, Mastercard, American Express and Diners Club. Dress: Island-style prevails, namely cool, loosely-fitting clothing. Hats, sunglasses and sunscreens are highly recommended. Visitors are asked to respect local customs by NOT wearing swimsuits and short shorts in town and public areas. Entry Requirements: Australian and US passengers traveling to Micronesia require a passport which must be valid for at least six months beyond your intended stay. Australian and US passport holders do not require a visa. Health Requirements: Consult your local doctor for information regarding vaccinations and inoculations. Language: The official language is English, though Japanese is widely spoken and local dialects are based on Chamorro. Power: 110-120 VAC electricity generated at 60 Hz (cycles). Tipping: Micronesia follows the American custom and tipping is an accepted practice in restaurants, hotels and baggage handling. The minimum cash tip for porter service is 50 cents to one dollar. See also Wikipedia: Chuuk Lagoon. Suggested Diving Essentials: Please bring your certification card(s) and maybe your log book. The Blue Lagoon Dive Shop has full equipment rental which you can arrange for in advance. Diving fees include tanks, weight belt and weights. Most divers are more comfortable with their own dive gear so bring what you think you want to use. Gear bag, BCD, torch with batteries and charger, mask, snorkel, fins, regulator and ocy, dive watch/computer, multi-level dive computer, spare parts kit, camera, flash, film. Lycra suits are recommended as average water temperature is 27 degC. For those that feel the cold, a 3 mm wetsuit is recommended. Cylinders with DIN valve fittings are available, but bring your DIN-Yoke adaptor(s) just in case. Optional Extras: Nitrox is available. If you have the required gear to support it, you can arrange to dive with independent twin cylinders, or manifold twin cylinders. Small and large stage cylinders are also available. Ghost Fleet of the Truk Lagoon: An Account of "Operation Hailstone", February, 1944, by William Herman Stewart. World War II Wrecks of the Truk Lagoon, by Dan E. Bailey. Hailstorm Over Truk Lagoon: Operations Against Truk by Carrier Task Force 58, 17 and 18 February 1944, and the Shipwrecks of World War II, by Klaus Lindemann.